An ideal venue for children's parties, Social/club meetings, sales and fairs. Accommodation includes the main hall measuring 14 metres by 5.45 metres (45’ x 18’) which can comfortably seat 70 people in theatre layout. 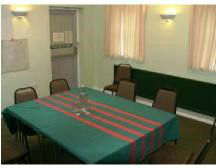 The hall is airy, well lit and has been recently redecorated. Tables of various sizes and cups and saucers are available and are included in hiring charges. The small Committee room which adjoins the main hall is included in all main hall bookings and can accommodate small meetings of up to 12 people but it is often used to serve refreshments when the main hall is used for events such as parties for children. It can be booked on its own but not if there is already a booking for the main hall at the same time. Access for wheelchair users is easy with no steps or ramps from the public highway. 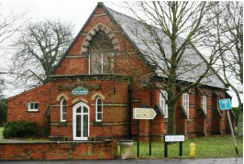 The nearest off street public car parking is located just a few yards away at the Keyworth Village Hall complex.The hall is available for hire (minimum session 2 hours) most mornings, afternoons and evenings. We aim to keep hiring rates low and reflect higher winter energy costs in our charges between November and April. See the brochure for details. (Competitive charges for long term regular bookings are negotiable).